Our clients love it, and our competitors hate it. 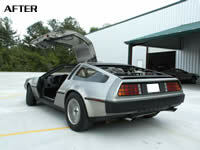 The DeLorean Motor Company (Texas) Budget Restoration Program (BRP) is the way to save money on everything you buy for your DeLorean. The intent of the B.R.P. 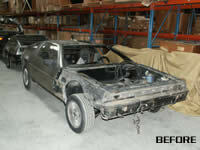 is to allow DeLorean owners who may not be able to complete a full restoration all at one time still get the parts they need to complete a restoration over time. By spreading out their purchases over the course of twelve months, the project is then much more manageable. To be eligible for the B.R.P., an initial purchase of $1500.00 of DeLoreans parts/accessories at regular prices from DeLorean Motor Company is required. This registers you in the B.R.P. for a period of 12 months from the date of the initial purchase, future purchases will be discounted by 10%. When your project is completed and you send us a photograph of your completed restoration, we will issue a certificate attesting to your accomplishment. Additionally, we will keep on file for future reference, copies of all of the invoices showing the parts you purchased over the course of your enrollment in the B.R.P. Discounts are not applicable with any other specials, promotions or discounts that may be offered in the future. The BRP is subject to modification and/or cancellation at any time.